we are Capable of creating a great variation of clubs Because there are many professional golfers at Honma, we have created many prototypes. The most highly rated models selected by our professionals have become the TW737 model line. The change between the TW717 & TW727 was the evolution of models in the same product lineup. The NEW TW737 has been re-examined, carefully selected and highly evaluated by professional golfers. - Out of the huge quantities of past TOUR WORLD products and prototypes, the models in which professional golfers gave high evaluations and were carefully selected for this evolution. As a result, four variations were selected with differences in profile and center of gravity. 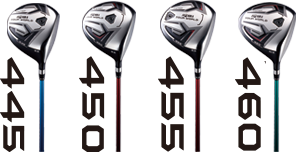 - Based on the models in which professional golfers gave specially high evaluations among the past models, the head profile and the overall body shape were enhanced. 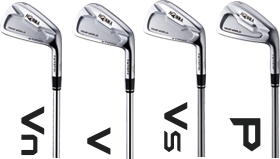 We created three models of the V Series that satisfy the professional and serious golfers and the P model (pocket cavity) is the forgiving model of the series. - The shafts were produced having variations in profile, but were similar by utilizing TORAYCA®T1100G graphite and the special rigidity adjustment method.